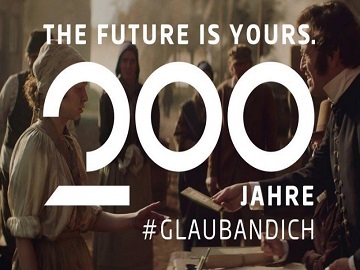 Erste Bank celebrates its 200th anniversary with a special commercial, that carries the tagline “The future is yours”. Titled “200 Years in 60 seconds,” the spot takes viewers on a journey back in time with Marie Schwarz, the bank’s first customers, through 2 centuries. “All we did was work every day. Sleep and then work again,” Marie starts her story, while onscreen images feature a young woman living in 1819, who works hard every single day. “There was no time for anything else, until this man appeared,” she also says, referring to an Erste Bank officer who talked to people about the bank and advised them to “Save now for the future.” Marie says that was the moment she saw it, “a future where the night becomes day, a future full of new beginnings, a future in which machines change the world’s pace, in which people would never lose hope, even in the darkest hour, a future where everyone has a voice and is not afraid to use it, in which no challenge is too great”. Featured as a volunteer at a marathon, the woman says in voiceover, at the end of the commercial, “I’m Marie Schwarz, the first customer of the Sparkasse. And the future starts when someone believes in themselves.” Finally, the tagline “Future is yours” flashes across the screen. Founded in 1819 as the first Austrian savings bank, Erste Group Bank AG is now one of the largest financial services providers in Central and Eastern Europe and has around 47,000 employees serving 16,2 million clients in more than 2,500 branches in seven countries. For last year’s Christmas, the group launched a heart-tugging commercial that tells the story of a lonely hedgehog who’s ostracized because of his spikes, but gets to feel some holiday love thanks to his classmates – a bunch of adorable woodland animals led by a squirrel, who come up with an ingenious solution.